What is Light Touch Support? Even the most effective organisations struggle to try new things. 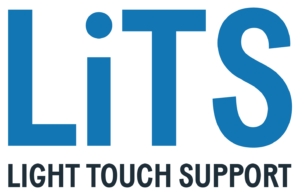 Our Light Touch Support (LiTS) program supports organisations that have ideas on using technology to make their work more effective, but are unsure about how to do so. We work to flatten their learning curve by providing concise, targeted advice and bespoke support. Each light-touch support partner starts with an idea and ends with a plan. First, we learn as much as we can about the organisation, their idea for using technology, and the system they are working to change. Then, we research organisations that have designed similar projects, and connect with our network to find out how they unfolded. We synthesise findings and reconnect with the partner organisation, sometimes assigning them ‘homework’. When appropriate, we publish our findings from scoping an issue, our tools research, and useful case study development or decision-making frameworks. If an area is particularly important but lacks existing resources, we invest in building robust, publicly available documentation for others facing similar challenges. Who asks for our support? We work with organisations that vary widely in terms of technical backgrounds, motivation and geographic location. Some partners are technically savvy, and want specific, targeted advice, while others are less familiar with digital strategies and data processes but eager to learn. Theory of change design: simplifying complex issues by defining concrete objectives and anticipated outcomes. Product development advice: improving the conceptualisation of technical development; orientation towards human-centred design; and emphasising the need to understand problems before investigating solutions. Sustainability plan development: designing business strategies; focusing on sustainability models. This includes advising on fundraising, organisational development, and how projects fit within the broader ecosystem of technology. Why do partners ask for our support? Since The Engine Room was founded, we have found when activists and organisations have questions about whether and how to work with data and technology, they almost always want to talk to a person. A PDF guide on its own is rarely enough. Quick, direct access to resources that would be otherwise be hard to find. Introductions to peer organisations with lessons to share about similar projects. A perspective on the landscape of related projects, and how their project fits in. Tough questions to help them identify blindspots. Cost-saving tips and warnings about potential pitfalls. Introductions to terms and language that can help shape project design and technical confidence. An open invitation to follow up with The Engine Room as their idea moves forward.